Get up close and personal with your next target! Specifically designed for crossbow use, this CenterPoint 4x32mm Scope puts you on target quickly with hair-splitting accuracy! Plus, it features a durable etched glass reticle with red/green illumination that's great for less-than-ideal hunting conditions. 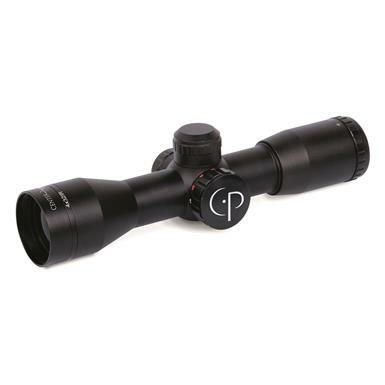 CenterPoint, 4x32mm, Illuminated Reticle, Crossbow Scope is rated 5.0 out of 5 by 2. Rated 5 out of 5 by JonDS from Very Satisfied Received mine yesterday. Shipping took about a week. Package contained Scope, Rings, Battery, and Allen Wrench. Illuminated reticles, in red and green, were very visible and have five intensity settings. Reticle also visible without illumination. Scope is adequately clear, and focus is adjustable. Zeroed easily, in about an hour, and held over ten groups perfectly. I am very satisfied. Rated 5 out of 5 by Bob3305 from Great price! I put my first circle at 30 the 2nd one at 40 then 2 down from there @50 so far it's been on point. Puts F-A-S-T targeting in easy reach. Fast and accurate, with hard-hitting 370 FPS speed.